After a few days of anticipation and excitement, I finally could hold it in my hands : the very special and beautiful Cult Beauty box designed by two of my favorite beauty bloggers : Anna & Lily. Here are 5 reasons why it was a very-much-needed-and-sensible-not-impulsive-at-all purchase. The box itself is so beautiful, with its white marble effect and gold accents, the pretty fonts and Anna & Lily's names written on it. It makes it a collectable item for the beauty fanatic that I am, and a perfect storage box for all the junk useful stuff I keep in my bathroom / bedroom / in every room of the apartment. Collection and storage, that's what I told the hubby when he gave me the weird look as I was frantically clinging on to The Box while he was collecting the recyclables. 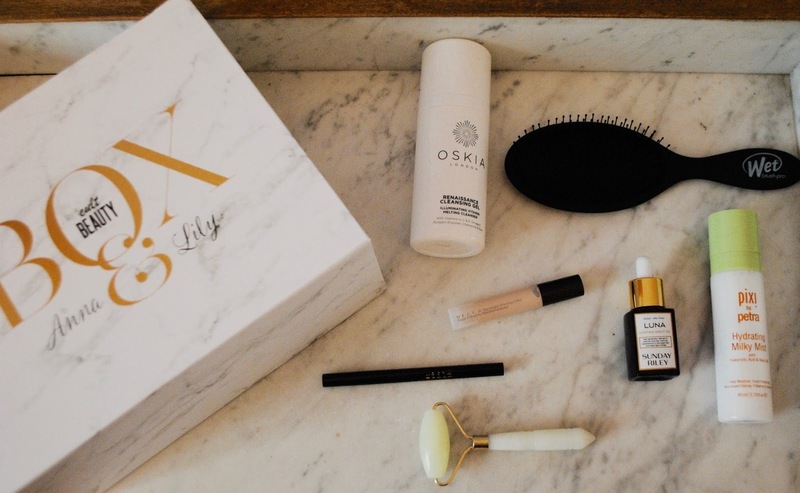 The items contained in this box are some of the most raved-about bloggers favorites, and owning them now makes me feel like I sort of entered the Skincare Pro League. To be honest, as much as I love beauty and make up, I can be quite lazy when it comes to my skincare routine. I've been using the same Vichy products for years and tend to stick to cleansing and moisturizing. Pretty basic. Now, I might be the only one, but I find that eye liner is the hardest thing to apply. I often find myself either avoiding it because I can't be bothered, or trying my hardest and yet ending up with two opposite looking black lines over my eyes. It's quite problem. This lack of eyeliner applying skills is the reason why I've never been brave enough to try liquid gel liners, and only ever buy pen liners. That being said, I think the Stila Waterproof Liquid Liner was made for me. Its fine nib makes it so easy to apply, its deep black pigments put to shame all the almost-black-but-greyish liners, and its waterproof formula makes sure it doesn't go anywhere during the day and prevents me from looking like a sad panda as soon as I touch my eyes. I simply love it, and it reconciled me with eyeliner. Bring on the 70's cat eye looks. Finally, this wonderful box fueled my curiosity, and I love it. The last two products picked up by Anna & Lily weren't necessarily items that I would naturally have put into my basket. Here you go, at-home facial tool. Then I was left with the Wet hair brush. This one I figured out what to do with, but I wasn't convinced I would actually use it. Not that I don't brush my hair, - I do-, but I'm so used to my Tangle Teezer that I wasn't looking to replace it any time soon. I don't know if this Wet brush will 100% replace my trusty old Tangle Teezer, but I have to say I really like it. It's great at taming my mane when I get out of the shower, and its fine bristles are very gentle and soft on the scalp, yet quite effective to detangle naughty hair. And it's nice to have a handle to hold on to - sorry Tangle Teezer. So not only did this box contain many amazing products that had been on my 'to try' list for a while, it also surprised me with new things and made me venture into new territories. Did you have a chance to get your hands on this amazing box ? Okay... I agree the box is actually gorgeous... like I would happily pay for that box on it's own! ahahah Hale thanks for making me feel even better about this purchase (not that I really needed any reassurance to be honest) !! Those are some lovely picks, truly! 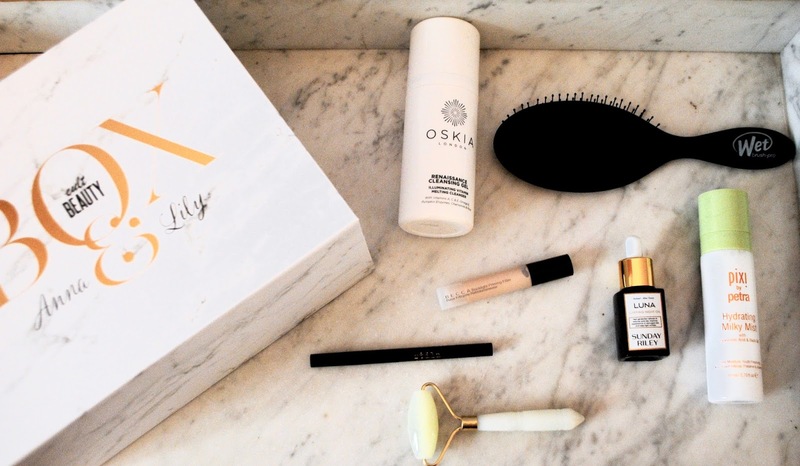 I'm dying to try the Oskia cleanser and the Becca highlighter!